Over the last couple of months Grace House hosted a special Christmas party and New Year celebration. The whole village and surrounding community were invited and it was our biggest one yet. As I’ve mentioned before, Christmas is a unique time in Thailand as it provides a great opportunity to share the gospel of Christ to whole communities. Below are a few of the activities that occurred near Grace House. Our staff UN and Elizabeth were also able to take some of the older kids into the refugee camp to do ministry. One particular opportunity included sharing the gospel with a family and many of the neighborhood kids. In addition to sowing seeds and teaching, they were also able to pray for the family and bring much needed encouragement. Some of the other activities of late have included the daily tasks of school and homework, bible studies and evening worship and daily chores. In addition to that, we recently built a new bathroom and are working on improvements for the garden and boy’s dormitory. 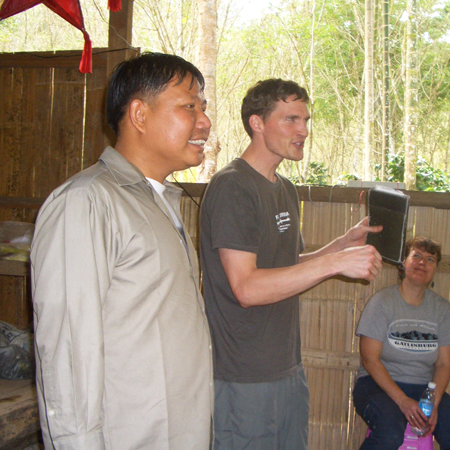 In addition, the local Kayan church that meets at Grace House each week has been continuing its ministry of making disciples in the village. Below are a few photos of the adult and children ministry taking place from one of the recent Sunday services. Please be praying for further growth and more impact in the hearts of the community. In all of these accomplishments and activities, it has been a joy to see and hear how the kids have helped out. The greatest highlight is seeing them serve others and present a Christ-like example to the world around them. Please pray for more opportunities to be a light and to minister God’s word to others. Thank you again for your continued partnership in His ministry and May God bless you!